April 24, 2010 -- When Cyril Thorn killed himself near the grave of his first wife, he was convinced that he was not ending his life, but just transfering to another plane of existence. "My research into the study of psychic phenomena has brought me to the place where I am better than 50 percent convinced that death does not mean the end of this entity we call 'I,'" he wrote in a note left for his current wife and found near his body. Thorn's first wife, Addie Lucille Thorn, died in 1946 at the age of 38. She was buried at Hollywood Memorial Park, now Hollywood Forever cemetery. Thorn married again, but his second wife quickly filed for divorce after Thorn started setting an extra place at the dinner table for his late wife. 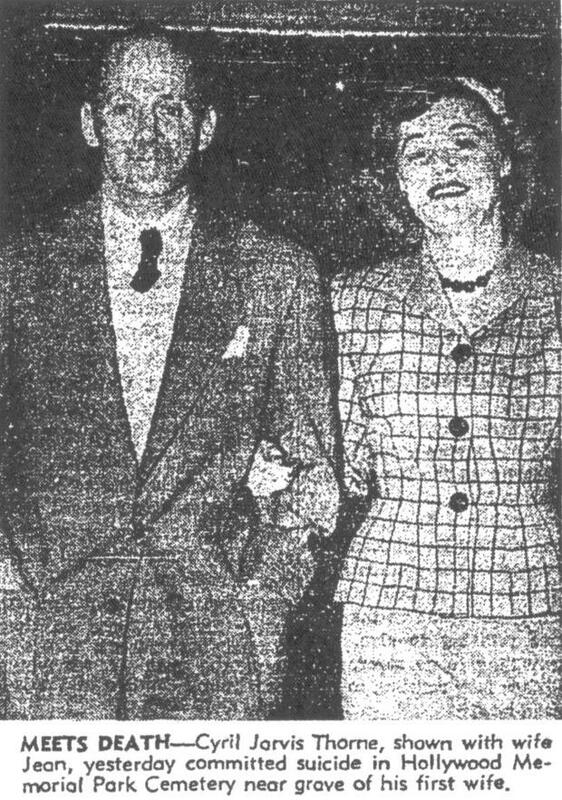 Thorn married for the third time on Jan. 12, 1952, in Las Vegas. Thorn, a retired contractor, had lived with his wife for the six months prior to his death at the Mayfair Hotel on West 7th Street in Los Angeles. According to his attorney, Thorn had long been fascinated by death, and had attempted suicide at least three previous times, twice by using a cylinder of carbon monoxide attached to a rubber mask over his mouth and nose. On June 24, 1953, at about 6 p.m., Thorn went to Hollywood Memorial Park. He stopped first at the cemetery flower shop to purchase flowers to place on Addie's grave. He then drove to her grave near the center of the cemetery, bringing with him a photograph of himself and his current wife on their wedding day, and a briefcase that contained the carbon monoxide cylinder and mask, along with a stack of typewritten notes he had written to his current wife, the police, and relatives. One of the notes contained detailed instructions for his funeral service. He requested that his funeral be a non-religious service conducted by Dr. Hereward Carrington of the American Physical Institute, a well-known author and investigtor of psychic phenonema, and that there be no music at the service, other than "waltzes in three-quarter time." He also requested that "some light, tall object be placed on top of the coffin in full view of everyone. ... I will try to knock it off if I can," according to the report of his death in the Los Angeles Times. "If I don't succeed it will prove nothing to those of you who do not understand. If I do, it will prove much." All of the notes expressed Thorn's eagerness to experience death, according to the Times report, and his belief in an afterlife. In the note to his current wife, Jean, Thorn wrote, "You have been a very perfect, dependable and lovely wife, and well deserve the very best from this chaotic fantasy we call life. ... My research into the study of psychic phenomena has brought me to the place where I am better than 50 percent convinced that death does not mean the end of this entity we call 'I.' Therefore, in the light of this evidence, I will just say good night, Jean, until we meet again." To the police, Thorn wrote, "I've ever been most amused at these people who desire to continue living when their physical senses have sadly deteriorated. To me, it is an example of the tops in stupidity." After leaving the cemetery flower shop, Thorn placed the flowers on Addie's grave, then sat on the grass beneath a cedar tree about 10 feet away. He took the 14-inch cylinder of carbon dioxide out of his briefcase, attached the mask to his face, and turned on the gas. Cemetery caretakers found his body. Beside Thorn's body was the wedding photograph of himself with Jean, and clutched in his hand was a love poem inscribed, "From Jean to Cy." Funeral services were held for Thorn at Utter-McKinley's West Hollywood Chapel, on Sunset Boulevard. As Thorn requested, Carrington conducted the non-religious service, with Thorn's wife, mother and sister in attendance. Also following Thorn's request, Carrington placed a cardboard cylinder and a plastic object on top of Thorn's coffin, and urged Thorn to attempt to move them. As the 40 people in the chapel watched the plastic object and waited for five minutes in silence, according to the Times' report on the service, "the experimental devices remained as still as Cy himself." "After the transition," Carrington told the crowd, "there must be a period of confusion, of disorientation to the new surroundings, which perhaps adversely effects attempts to perform such an experiment." As he sat next to Thorn's coffin, Carrington urged him to try again -- "Cy, we will now ask you to try to influence the objects, as you said you would. Try, Cy." Again, the objects didn't move. "It is, of course, hard to estimate the length of time that would be fair for an experiment such as this," Carrington said. "We could sit here for an hour and nothing would happen. And in the next moment, something might happen. Who can say?" Thorn was buried at Hollywood Memorial Park, next to his first wife, and near the scene of his death. Interestingly, although the newspaper reports and most of the documentation on Thorn's life spell his last name "Thorne," his grave marker spells it "Thorn," as does Addie's grave marker. Special thanks to "Hollywood Remains to Be Seen" pals Sara Henderson and L.A. true crime expert Joe Walker for their research and assistance on this story.